U.S. Ambassador to Nigeria, Stuart Symington, is expected to be summoned by the Federal Government over the comment allegedly made by President Donald Trump about President of not only being ailing but lifeless. The Ministry of Foreign Affairs as at the time of filing this report, kept mum over since the news broke. The Financial Times while reporting the planned meeting between Trump and his Kenya’s counterpart, Uhuru Kenyatta billed for last Monday, claimed that Trump after meeting with Buhari last April, the first with any African leader told his aides, “he never wanted to meet someone so lifeless again”. The Monday meeting which according to the report is part of efforts by the Trump administration to foster stronger ties with Africa is hoped would end US neglect of the continent. “Donald Trump will welcome Kenya’s Uhuru Kenyatta to the White House on Monday for what will be only the second one-on-one meeting the US president has held with a sub-Saharan African leader since he took office last year. 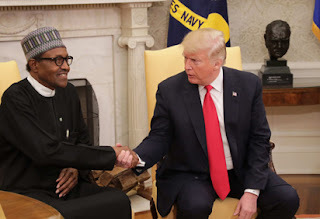 “The first meeting, with Nigeria’s ailing 75-year-old Muhammadu Buhari in April, ended with the US president telling aides he never wanted to meet someone so lifeless again, according to three people familiar with the matter”, part of the report claimed. However, when contacted, officials of the embassy declined comments on the issue. Calls to the spokesperson at the embassy, Russell Brooks, were not answered and another staff at the embassy who pleaded anonymity refused to also say anything.